I got a notification (and a pen) from the Daily Mail that mine had been chosen as their letter of the week. Published 13th May. That is pretty cool. All the moreso since the letter, below, is one I am extremely proud of and which contains a proposal that could be literally world changing (the world being Mars). The letter had gone out to 30 odd British newspaper and not appeared when I googled it so I assumed it had not been used but the Mail don't put their letters online. I would, once again, like to take the opportunity to say that I think the Mail is the only real newspaper in Britain. The only one that goes looking for real news rather than rewriting press releases and "reports" from government, or government funded sock puppets (or in the Guardian's case, under the counter smears from Conservative central office or assorted genocidal Nazis). This is presumably why it is relentlessly denigrated by the propagandists at the Ministry of Truth BBC. I've shown it as printed in normal type normally, with my originals in italics. That makes it more difficult to read but the original article it was derived from was on my blog here. The editings have been done with respect for the content and must have taken time. I suspect they have improved my grammar a little, though sometimes the most grammatical is not the most impactful. The editor dropped the "Westminster" from "Westminster MPs" - I assume because it was used in the Mail across the country not just Scotland though local references to Clydespace and the Forth bridge cost were kept in, which is good. It was slightly shortened, remaining the longest letter of the day (May 13th). I am happy with that editing. Google still indicates no other Scottish or UK paper found it reached their literary standards. I may be biased but I think the Mail's literary judgement is better than theirs. I also trust their judgement on what is popular with readers more than the other papers - and on that I have the support of their rising number of readers as competitors readership falls. The death of Professor Colin Pillinger who dreamed up whose brainchild the 2003 spaceprobe Beagle 2 was, is a time for a little reflection thought. His brainchild It was built on a shoestring and made so light that ESA couldn't find any excuse not to include it with its their probe to the red planet. Against all of the expectations of our political class it became incredibly popular, and a source of pride, across Britain. That Which shows good judgement by the people - finding life on Mars means life must be common across the universe and. One life creating accident on Earth is possible but 2 and only 2 isn't. If there is a more important philosophical question than "are we alone in the universe" I have yet to hear it. Beagle 2 was renamed So they relabelled it a spaceprobe in its own right rather than just an experiment (& Pillenger was awarded gave him a CBE). But Then it failed, as scientific experiments (and half of all Mars probes) often do when something unusual is being attempted if they are pushing the envelope. The "the" added ESA said it they would take it the Beagle programme over and do it "more efficiently" - at 10 times the cost. Our Westminster MPs told Pillinger why they thought Beagle 2 had failed explained to him, from the eminence of their technical knowledge, the reason for his failure. He hadn't spent enough (though they hadn't offered more) or taken long enough. ESA got their budget but "but" added, originally new sentence Beagle 3 is still unlaunched. Yet another example of how our "space budget" largely isn't used for space but for co-opting something people are willing to see money spent on and then hijacking the money for the bureaucracy. I have written before about Now we have cubesats (square "black boxes" 10cm on a side launched into space - that are as revolutionary to space experimentation as containerisation was for shipping). And of how an engine is being designed that can drive a cubesat, or a cluster of them several, across the solar system. I suggested then they would be ideal for exploring and assaying the asteroids beyond Mars. They Cubesats work because as of Moore's Law predicted, that computer capacity doubles every 18 months, so equally efficient means devices can be made ever proportionately smaller. So lets see how much smaller. Beagle 2 was launched 11 years ago. Add a couple of years development time to 13 years and according to by Moore's Law capacity is up (2^8.6) 400 times - a cubesat of 100g 1/10th of a kg would be as efficient as Beagle 2 enough today. Finding microscopic life doesn't require size. Even a drill to find material beneath the surface, which is where any life on Mars is likely to be, need not be big. In fact, because of the square cube law, landing a small probe is easier than a large one. Cubesats (with "with" added 40% of all all those now in use around the ones in the world have Glaswegian hardware containing hardware produced in Glasgow) are being put in orbit now for under £100,000 and they are proving to be "proving to be" added a technology that which is game changing for space development. Beagle III would be much more complicated than 1 communications cube in Earth orbit. But how much more. It looks to me like as though the cost of launching Beagle 3 "cost - 3" added would be far more expensive than cubesats at likely to be several million £s although that which is less than small change to government. Less than we spend subsidising 1 single windmill. Less than 1 metre of the new Forth bridge. Is that 2 added Worth spending to answer if we get closer to answering arguably the ultimate question about life and the Universe? I would think Westminster, and all our best known philanthropists would fight for the opportunity to honour Professor Pillinger thus. If there are no technical reason why I am wrong and I don't think there are, then I hope I and perhaps others can push this further. If government (UK or Scots) were to put up even £1 million I am sure sponsorship of any excess would be possible, as much of the much greater cost of Beagle 2 was raised privately. PS The Forth bridge is only clearly cheaper if you just count the central span of 1,006m. The full length is 2,512m which comes to £916,000 per metre. 7/8th of this remains provable not engineering costs and the Holyrood politicians refuse to explain where it went. New ThinkScotland article on the danger of us waking up with a collectivist constitution. Please put any comments there. I have written on ThinkScotland before about the purpose of constitutions. I incline to the view that a constitution is necessary primarily to say what the limits on government power are. But in writing your constitution let me invite attention to the wonderful virtues of the negative! Accentuate the negative" Let your document be studded with things the government is forever forbidden to do." The SNP and the Scottish political establishment seem to consider the opposite. That a constitution should exist to give the power to the state and indeed duty to do ever more, and to remove the possibility of us objecting. This is the precise opposite of the principles on which Anglo-Saxon politics have worked since at least Magna Carta. European Convention on Human Rights (ECHR), would be embedded in the written constitution. Now most of those sound nice, except the ECHR of which we have actual experience and we know how it means enforced votes for prisoners and interpretations of words which are both unusual and have extended government control of ordinary people, usually in the false name of "minority rights". Lets look at what they mean, and sometimes what they could well mean if interpreted enthusiastically by a European court that works as it has. * Equality sounds good but it means the state has a constitutional duty to interfere in our lives any time somebody complains. Does that mean people being sued if results don't produce the "right" number of women or minorities - it does in the USA where their Constitution has been "reinterpreted" to find such a right even though it isn't written. A few days ago an independent EU candidate was arrested for reading out a Churchill speech about Islam (don't worry you didn't miss it - its only news on the BBC when people get arrested in Russian churches for insulting Christianity - free speech arrests in Britain don't count). However at least in the current Britain this guy will have an opportunity of a trial. Under the SNP's constitution he could make no defence. * This is even worse. What income, lower than the national average ensures "self-respect"? In which case this is gives the state a right and duty to ensure absolute income equality - not even Mao managed that. * This makes the catastrophic global warming lie and the SNP's promise of "100% renewable by 2020" the rigorously enforced, unshakable law. To call this economic suicide is greatly understating. * I'm a bit agnostic about a separate Scotland having nuclear weapons so not to worried about this "leftist" shibboleth. * Any independent state has this in some form. This is just a token blow against NATO. A separate Scotland would be silly to go to war with anybody anyway. * Local government will "exist". what does that mean or guarantee? * If the Scots £ fails to keep parity with the UK one, these rights would become impossible to maintain at parity with UK values. that would mean Holyrood would have no lawful alternative to increasing taxes or printing money. Both are obviously economic suicide but any lawful alternative is excluded. * Current practice suggests this means the "every kid has a social worker with power over them" legislation and probably an extension of it. Scotland already has twice as many kids per capita in council "care" - the results of which consistently mean that when they grow up they are at the wrong end of any measure of human failure. "Children's rights" in this instance do not mean any rights for children but merely the right of social workers to build bureaucratic empires on their bodies. * A catch-all. everything will be forbidden except where it is mandatory and subsidised. incident proved it wasn't down south. But as with the scots media generally, the issue doesn't even get aired. I am afraid the statists have stolen a considerable march on this issue. ALL the discussion I have seen of constitutions has been by "leftists" within the political elite. This is a flat repudiation of the entire liberal Enlightenment tradition which was once, correctly, the glory and much of the reason for success of Scotland. Even if we vote No we may expect these to be raised as part of the "new powers" that Westminster has shown some inclination to give. That would be new powers purely for those in charge not for us. The paper is also imprecise about how this constitution would be set up. "One of the first and most fundamental tasks of the parliament will be to establish the process for preparing Scotland's first written constitution". Others may be included but, certainly as long as one party has majority, I assume it will be limited to those and such as those. As a member of UKIP (the street fascist attack on us having been publicly supported by Salmond & having been 100% censored by the BBC state owned broadcaster from speaking in the referendum "debate") I am not anticipating even being asked what sort of constitution I would like. Even if, as polling on the upcoming EU election suggests possible, we replace the Tories as Scotland's 3rd party this May. Presumably between the independence vote and the adoption of the constitution Holyrood would vote through some Articles of Association (as the USA did) which would turn out to reflect what the SNP want anyway. The example there is Blair's evisceration of the Lords on the promise it was only provisional till they worked out how to create an effective second chamber - for which we are still waiting. Noticeably absent from the Scotland's Future guide is any mention of us getting a referendum on our constitution. That looks like stitch up. This is the same political class that boasts that the, after our pseudo0independence, Scots people will not be subjected to the worry of a referendum on our membership of the EU as the poor benighted English will. Free market proponents of separation generally say that after it happened Scotland would be forced into the real world. The lunacies of our current leaders would not be maintained. That without the safety net of Westminster the Scottish people would vote, sharply, for the sort of traditional liberalism that is working worldwide. The problem is that constitutions are designed to keep particular values in place. To remove the duty of ensuring we have the world's most expensive electricity and highest taxes would require junking the brand new document - probably requiring at least a 2/3rds majority and a lot of time. Meanwhile we would be stuck with an economy with all the freedom, charm and success of North Korea. Perhaps I should join the "debate" and say what sort of constitution I would go for to maximise freedom and growth. Any bets that I could come up with a constitution limiting government interference and maximising freedom and economic growth that would both represent "traditional Scottish values" (going back to the Enlightenment) rather better than windmill subsidies do, and would, after any genuine uncensored "debate" would get more voting support from the Scottish people than the SNP's selection of collectivist shibboleths would. Rolls-Royce (RR/) Holdings Plc is designing unmanned cargo ships. Rolls-Royce’s Blue Ocean development team has set up a virtual-reality prototype at its office in Alesund, Norway, that simulates 360-degree views from a vessel’s bridge. Eventually, the London-based manufacturer of engines and turbines says, captains on dry land will use similar control centers to command hundreds of crewless ships. Drone ships would be safer, cheaper and less polluting for the $375 billion shipping industry that carries 90 percent of world trade, Rolls-Royce says. The company’s schematics show vessels loaded with containers from front to back, without the bridge structure where the crew lives. By replacing the bridge -- along with the other systems that support the crew, such as electricity, air conditioning, water and sewage -- with more cargo, ships can cut costs and boost revenue, Levander said. The ships would be 5 percent lighter before loading cargo and would burn 12 percent to 15 percent less fuel, he said. Crew costs of $3,299 a day account for about 44 percent of total operating expenses for a large container ship, according to Moore Stephens LLP, an industry accountant and consultant. Unmanned ships are currently illegal under international conventions that set minimum crew requirements, said Simon Bennett, a spokesman for the London-based International Chamber of Shipping, an industry association representing more than 80 percent of the global fleet. * have minimum crews operate as parking valet crews to hop onto the ship just outside the territorial waters of a port that requires minimum crews. There needs to be a hackproof way to stop the ship safely. This would prevent the ship from being used to blackmail the ship owner or others by ramming it into something that would cause a lot of life loss and expensive damage. Attempts to board the ship and remove containers is not that meaningful. It would be difficult to unload the ship quickly. It would be easy and affordable to put tracking beacons on each of the different containers. This would also be useful for rapid wireless inventory. The proposal is technically not entirely automated sailing since the land base will direct it and "hundreds" of others. But it is close as dammit and I'm sure the remaining under 1% could be automated too if required. The cost savings listed are pretty substantial. Ships 5% lighter, fuel savings app 12.5%, other operating expenses down 44%. Comes to 50% of the industry's $375 bn costs. I can see no reason why cranes loading and unloading could not be more easily computerised. I have previously, several times, written of automated trains, which could deliver single container carriages anywhere with rail connection. We also have automated driving systems which may, as soon as politics allows, become commonplace. 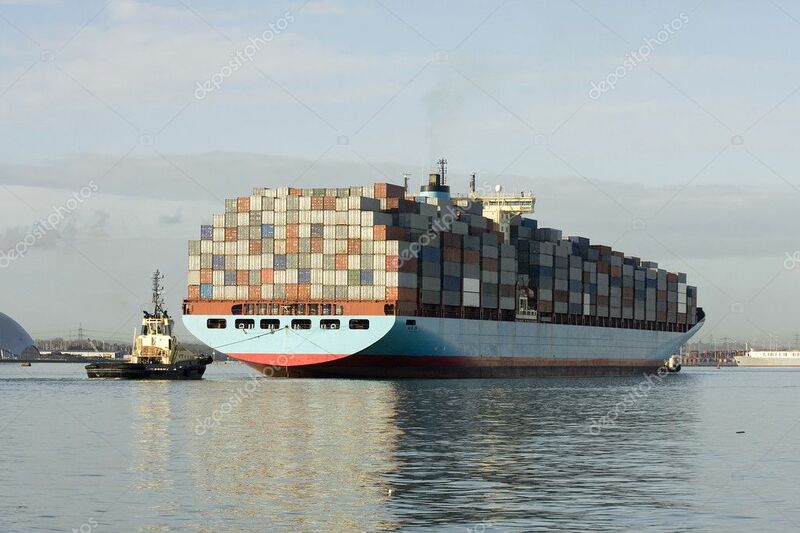 The net effect of this is that, pretty much as soon as it is allowed, it will be possible to dial up the uplifting of a container in any developed country and its fairly speedy delivery anywhere in the world, untouched by human hands and at a much reduced, almost token, cost. Long distance sea freight is already easily the cheapest transport we have so halving it would be astonishing. But easy. On piracy - note that ransoming the crews is a large part, possibly the main part of their profits. That will go and I don't see anybody being able to unload hundreds of containers in a Somali fishing village. As the underlined bit shows the barrier is political agreements on crew levels. Can't criticise that in the past - it looked like and probably was a decent bit of regulatory welfare. However, as the technology always moves far faster then politics we are left with it being an absolute ban on progress. Perhaps the rules will be very quickly removed, or perhaps we will see all the bureaucracies fighting an unrestrained battle to hold onto their jobs and power - and since it is international agreements it is likely to be easy to pass the blame for footdragging around till "nobody is to blame". In which case libertarians should be prepared to take up cudgels too. Labour "We have no limit on our ambition for Scotland and we want no Scot to have a limit on their's" and "Labour will build a moral economy where the national wealth is used for the benefit of all" and promises growth with "a rising standard of living". Who can be against any of that except that if equality of outcome is enforced to ensure nobody has a below average income, then nobody can have the ambition to have a higher than average one and if we have that much state control of economic outcomes we can't have the free market incentives needed for growth. So this is just cynically promising everything to everybody, knowing it is impossible. We have to make choices. I think we should choose growth because that maximises the benefit for everybody. Labour are perfectly entitled to say they prefer total equality to being better off but it is dishonest to treat us like children and promise to maximise both. Of course they support the EU but the only reason they can come up with for doing so is that we benefit from the British, partial, rebate! And they promise more foreign "aid" and to be "global leaders in tackling climate change" which is dishonestly portrayed as making money rather than destroying it. List a number of things they have done for us. Including to have cut Labour's deficit by 1/3rd, omitting that they promised to end it in this parliament. But most interestingly is "We've taken all the action we can under the current EU agreements to fix our immigration system". They promised at the last election to cut immigration to "10s not hundreds of thousands" which is actually a tougher promise than UKIP's to reduce it to 50,000. Of course they broke it and immigration is still well above 200,000 but the EU regulations were in place when they made the promise. This is thus a public admission that their promise was a deliberate lie - that it was always impossible to carry out their promise while in the EU.
. It is all about nationalisation, forcing us to eat "local food", and "creating thousands of jobs in green industries" (this is a cynical lie as they know perfectly well that each subsidised "green" destroys 3.7 real jobs). In an accompanying "newspaper" they attack the SNP for pouring insufficient billions into windmill subsidy and define the catstrophic global warming we are supposed to be experiencing as "the defining issue of our age". On that we agree. Catastrophic warming is not happening, indeed there has been no warming, of any sort, for 19 years - it is a totalitarian lie designed to give the political elite more power and more of our money (as they all provably know or it would not be necessary to suppress discussion). It does indeed define all the parties promoting this lie. Sorry I didn't get anything from the SNP and LibDems. This graph was put up by Tim Worstall from an article in the New Yorker. He was making a point about rates of return being higher when property rights are insecure, as they once were, and are looking like becoming again. However I was interested in the yellow line which fits in with stuff I have been saying before about growth in western countries having peaked in 1959 and that, by all the normal rules of statistics we should expect such curves to rise at an increasing rate, as this did till the 1950s and then the rate of growth to tale off. If that yellow curve had continued at the rate of acceleration form 1950-2012 as up to 1950 we would have an average growth rate of 7-8% now. The further decline in growth after 2012 - is obviously not actual but only what the miserabilist who did it is extrapolating. Nonetheless valuable since it shows what is intended if we allow it. When you have different research coming to similar endpoints you can be fairly sure you are onto something. In this case that it is only because of the Luddism, primarily but not exclusively in suppressing the very cheap electricity we should all have now, and the growing degree of state regulatory parasitism that is responsible. Technologically we could have that 7-8% annual growth at any time. Actually probably quite a bit more for some years as we catch up on using technology that has been suppressed. 60 years of growth averaging 3.5% when we could have had 6% means the entire planet could have been 4 times better off by now. "After a decade of study of the subject, I can assert that DDT has no adverse effects on human health, period.” - Also shows even the claim of it thinning eggshells was a fraud. Meanwhile the eco-Nazis continue to 1.5 million people (mainly African kids so nobody cares) every year. The medieval warm period in Japan. The Japanese consider cherry blossom as a national symbol and have always celebrated, and recorded, the day each year it appears. Shows beyond dispute that the ecofascists, who always claimed it was only a European phenomenon (on the basis that European records only recorded it in Europe) were, once again, lying. Rather fun - a reservoir has been emptied because a kid peed in it. The management acknowledge that they regularly find animal's bodies there, presumably some of them have peed to at some time. This lunacy is drawn from the way the opponents of the nuclear industry are unable (or unwilling) to understand the concept of dilution. It is the application of the false LNT theory in a new area and inevitably, as with nuclear, means ignoring far "worse" instances that have always occurred naturally. An indication of the way public sector engineering is now done by political apparatchiks not engineers. Some time there will be an unamusing tragedy. The magnificent Matt Ridley showing that e-cigarettes save lives by getting people off the far more lethal normal cigarettes. This, of course, is opposed by the ban-everything fascists, whose smoking ban has always been about power and care nothing about health. That means thousands of unnecessary deaths annually but that is not the tragedy I mentioned but, as Stalin said, only a statistic. "If somebody invented a pill that could cure a disease that kills five million people a year worldwide, 100,000 of them in this country, the medical powers that be would surely encourage it, pay for it, perhaps even make it compulsory. They certainly would not stand in its way. The NHS is confident that these devices are about 1,000 times less harmful than cigarettes. The government confirmed this figure in a parliamentary answer to me. It’s the tar in smoke that kills, not the nicotine — a substance that is about as harmful as caffeine. Shale could add £50 bn to the UK economy if the bastards would let it. According to our government approved media abortionists are always good and black people are always the nice victims. Here is news where even the media have difficulty supporting the black abortionist. 900 year study shows no sign at all of current warming. Both Mediaeval warming and Little Ice Age do show up.